Born in Devon, but now living in Ryedale Jane Lovering is the winner of both the RoNY Award (Romantic Novel of the Year) and the RoNA Rose Award for novellas and shorter romantic fiction – an achievement which is almost unique. 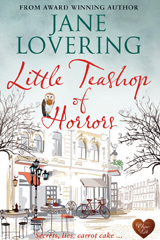 She will be discussing the most recent book in her Yorkshire Romance Series The Little Teashop of Horrors and explaining how she keeps writing these gems. For lovers of this genre this event is pure gold.